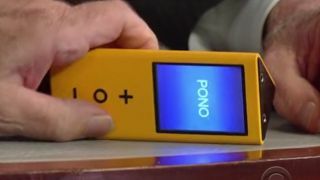 Neil Young has beef with the quality of digital audio and he's on a mission to save it with a new music service and player named Pono. With a line of portable music players, a download service and digital-to-analogue conversion technology coming out next year, Young isn't messing about. The player itself was shown off on the Late Show with David Letterman in the US, and is a chunky-looking triangular device with minimal buttons and what looks like two headphone jacks. The combined music ecosystem is meant to preserve the full, original sound quality of recorded music rather than the watered-down digital versions that have become the norm thanks to iPods and the like. Warner, Universal and Sony are already on board, with Warner at least having already converted 8,000 titles to 192kHz/24-bit sound to be compatible with the incoming music player. That's not to say that your existing library of lesser-quality tunes won't work with the new player but if you want to hear them "properly" as Young hopes, you'll have to buy the converted files (but if you've already bought an album on vinyl, tape, CD, mini-disc and MP3, are you really going to buy it again?). "The company is designed to rescue my art form, music, from the degradation in quality that I think is at the heart of the decline of music sales and ultimately music itself in popular culture. "With the advent of online music iTunes has come terrible quality. An MP3 has less than 5 percent of the data found in a [Pono] master file or a vinyl record. "My goal is to restore an art form and protect the original art, while serving quality to the music lover."